Home » California » family » places » Daddy Gets to Play at Happy Hollow! Daddy Gets to Play at Happy Hollow! When it comes to the weekends, Miss T knows one parent very well, Daddy. She knows who will be more than happy to be playing. So whenever she can off with the Daddy to places where they can both be kids! What did you do this weekend? The weather was so nice, Trinity took us to the newly renovated Happy Hollow Park & Zoo. It was packed and people were excited. Miss T had a blast, and we look forward to many more visits this summer. We purchased the seasons pass to make sure we get out and enjoy some family time once in a while. 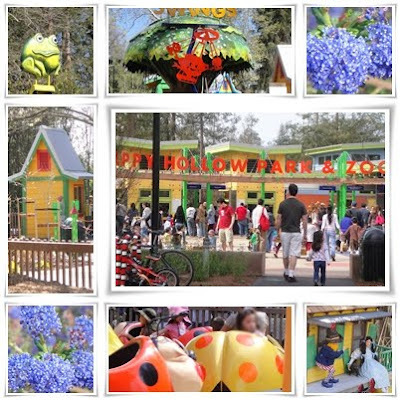 Happy Hollow is the wonderful all in one Park, Zoo, Rides, and Conservatory. My kids used to ride the swings over and over again. I tried it once on adult sized swings and was so sick. It looks like loads of fun. I suppose we all like to let ourselves go and become kids again sometimes. I'm having fun just to see these pictures! What a great place to see. What a colorful place! It's great to enjoy the day with Miss T.
Looks like fun. Happy Blue Monday. Happy Hollow looks like a wonderful place to play. I love your colorful pictures and mosaic. Happy Monday! Making memories and sharing with us is great!!! What wonderful fun. I enjoyed just looking! Kids just love places like this, maybe Daddy does too!